As we walk along the path of our journey with Christ, we inevitably come to a point in the road where we stop and begin to examine ourselves to determine if we are bearing any fruit. We also do this with our Christian brothers and sisters as we attempt to hold each other accountable in our journey together. This is a good and necessary time of introspection, important because we are told that we will know each other by our fruit (Matthew 7:16) and that any tree that does not bear good fruit is cut down (Matthew 7:19). So as we engage in evaluating ourselves, exactly what sort of fruit should we be looking for? Most of us tend to think of the fruit of the good Christian life in terms of actions or works such as helping those in need, volunteering at the church or hospital, visiting those in prison, giving money to good causes, praying consistently, and the like. These are all good things and are representative of the types of activities that we would expect someone filled with the Spirit to be drawn to and to engage in, but they themselves are not the fruit. Read Galatians 5:22 again. The fruit of the Spirit is not a list of actions or activities but a list of attributes. As we draw ever closer to God in our journey through life, His Spirit works within us to change us and to bring us closer to His image. We begin to see the fruit of love and of joy and of peace bud in our hearts and as these attributes become the natural and dominate characteristics that begin to define us, then the old ways of bitterness, envy, strife, and lust fall away. These attributes take hold of us and become our core character. Once this happens we cannot help but to do good works. Doing good works becomes our very nature and not a force of will. Jesus tells us that out of the abundance of the heart the mouth speaks (Matthew 12:34) and the writer of Hebrews says that the Word of God judges the thoughts and attitudes of the heart (Hebrews 4:12). It is our heart that God ultimately judges and, thankfully, it is our heart that His Holy Spirit transforms as we submit ourselves fully to Him. We must often engage in periods of introspection and ask God to point out the areas in our lives that He would have us surrender to Him for divine maintenance and retrofitting. 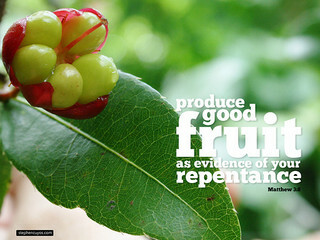 Make sure as you examine your own fruit, that you look most closely at the attributes of your heart and where you find characteristics inconsistent with the promised fruit of the Spirit give these to God and allow Him to continue to change you into the person that He intends you to become.